You may have seen the Japanese candy Hi-Chew on the shelves of stores like Target, CostCo and Walmart. It’s chewy, comes in a variety of fruit flavors and is now being made in North Carolina. 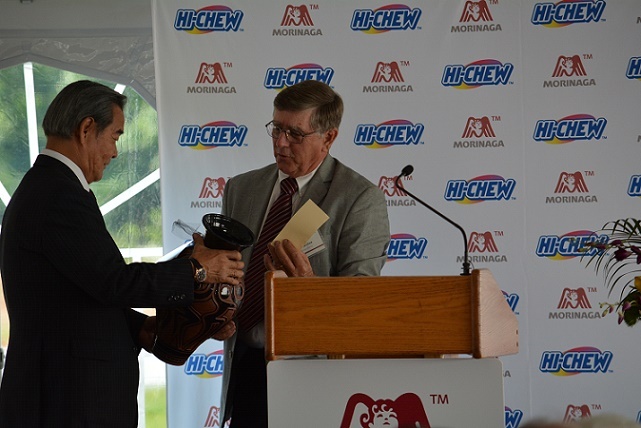 The makers of Hi-Chew, a Japanese company called Morinaga America Foods Incorporated, opened their first American production facility in Mebane, North Carolina. The building’s grand opening was celebrated Thursday by the company’s top executives, local and state officials and by Governor Pat McCrory, who is a personal fan of the treat. Governor Pat McCrory speaking at Morinaga Grand Opening. Photo via Blake Hodge. Beyond the governor’s fondness for the sweet, he said the facility is the beginning of what he hopes to be a long relationship with Morinaga. 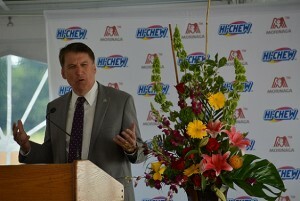 The grand opening was held outside the new 120,000 square foot Hi-Chew factory in Mebane. During the ceremony, Morinaga’s president and CEO, Toshiaki Fukunaga, spoke about his experience working in North Carolina. Sake Barrel at Morinaga Grand Opening. Photo via Blake Hodge. Morinaga’s $40 million investment has helped to employ over 80 people, and according to Mebane Mayor Glendel Stephenson, the company plans to continue expanding. Increased employment opportunity is a focus for Steve Brantley, the director of Orange County Economic Development. 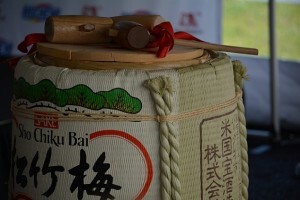 The event ended with a ribbon cutting ceremony and a traditional Japanese breaking of the sake barrel. The barrel was filled with Hi-Chew candy that Governor McCrory tossed into the crowd. The factory is currently in production and is distributing Hi-Chew candies throughout North Carolina and the U.S.